CARFAX 1-Owner, ONLY 7,551 Miles! Navigation, Sunroof, Heated Seats, All Wheel Drive, Turbo Charged, iPod/MP3 Input, CD Player, Power Liftgate, Back-Up Camera, APPLE CARPLAY COMPATIBILITY, NAVIGATION SYSTEM, Alloy Wheels READ MORE! Sunroof, All Wheel Drive, Power Liftgate, Back-Up Camera, Turbocharged, iPod/MP3 Input, CD Player, Aluminum Wheels, Dual Zone A/C Privacy Glass, Child Safety Locks, Steering Wheel Controls, Electronic Stability Control, Electrochromic rearview mirror. PREMIUM PACKAGE SiriusXM Satellite Radio, Comfort Access Keyless Entry, Lumbar Support, DRIVING ASSISTANCE PACKAGE Speed Limit Info, Instrument Cluster w/Extended Contents, Head-Up Display, Active Driving Assistant, lane departure warning, forward collision warning, pedestrian warning and city collision mitigation, Active Blind Spot Detection, NAVIGATION SYSTEM Remote Services, Advanced Real-Time Traffic Information, COLD WEATHER PACKAGE Heated Front Seats, Heated Rear Seats, Heated Steering Wheel, Retractable Headlight Washers, APPLE CARPLAY COMPATIBILITY, POWER FRONT BUCKET SEATS 8-way power adjustable front seats w/2-way manual headrests (STD). BMW xDrive28i with Dark Graphite Metallic exterior and Black Nevada Leather interior features a 4 Cylinder Engine with 240 HP at 5000 RPM*. 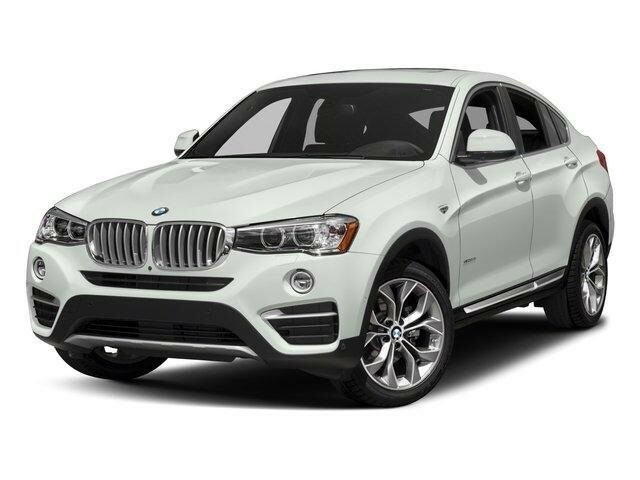 KBB.com's review says "Whether you choose the base model with its 2.0-liter turbocharged 4-cylinder, or the X4 M40i and its 355-horsepower turbocharged 6-cylinder engine, both paired to a quick-shifting 8-speed automatic, you'll likely be surprised with the X4's acceleration.". Pricing analysis performed on 9/25/2018. Horsepower calculations based on trim engine configuration. Please confirm the accuracy of the included equipment by calling us prior to purchase.